Are you looking for a quick, affordable way to upgrade your wardrobe? Are you a big fan of the top-quality holsters and accessories available from High Noon Holsters? Our broad assortment of "swag" includes beautiful Kimber polo shirts you'll be proud to wear on the golf course, at the office or wherever your travels take you. 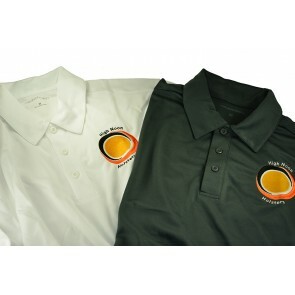 These polo shirts include an embroidered High Noon Holsters logo on the front, enabling you to proclaim your support for our industry-best, cutting-edge product line. These attractive Silk Touch shirts are designed to maximize your comfort — the cationic double knit polyester material wicks moisture away from your body to keep you dry and cool. The three-button placket with dyed-to-match buttons and self-fabric collar with open-cuff sleeves combine to deliver a classic, professional look you'll be proud to show off wherever you go. Your color choices include white and steel gray, while the innovative PosiCharge technology ensures the colors will not fade over time. Here at High Noon Holsters, we want you to be completely happy with every product you purchase from us. We ensure our shirts meet the highest quality standards. However, if you find the product to be less than perfect, please let us know as soon as possible, and we'll do everything we can to correct the situation. If you're still not satisfied, you can return the item to us with 14 days of receipt for a refund — no questions asked. We've made our e-commerce site easy to navigate — you'll be able to find what you're looking for quickly. You can then add the items to your shopping cart and complete the simple, secure checkout process using your preferred payment method, including PayPal, Discover, MasterCard, Visa and American Express. If the product is currently in stock, we can typically ship it within one to five days. We invite you to browse our polo shirt collection and place your order today. If you have questions or need assistance, feel free to contact us by phone or email.